(Phys.org) —A team of researchers at China's Nanjing University of Aeronautics and Astronautics, studying graphene properties, has discovered that the act of dragging saltwater over a piece of graphene can generate electricity. In their paper published in the journal Nature Nanotechnology, the team describes how in seeking to turn the idea of submerging carbon nanotubes in a flowing liquid to generate a voltage on its head, they came upon the idea of simply dragging water droplets across graphene instead. Because of graphene's unique electrical properties, researchers have been hard at work trying to determine if it can be used to generate electricity at a lower cost (and in cleaner fashion) than conventional methods. To date, scientists have been using a technique whereby ionic fluids are pushed through different types of nanostructures—it works, but a pressure gradient must be used, which causes the approach to be inefficient. Others have looked at putting carbon nanotubes in moving water to capture electricity that is generated, but once again, a pressure gradient is needed. In this new effort, the researchers have found a way to generate electricity using graphene without the need for a pressure gradient, or any other mechanism other than gravity. 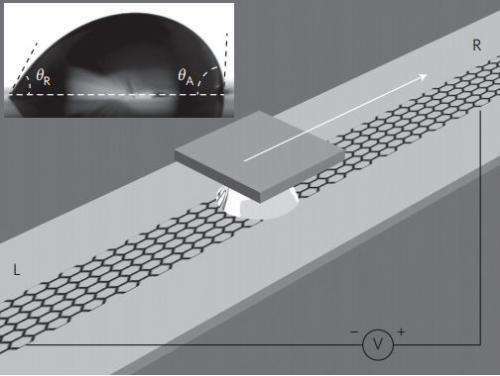 In their experiments, the researchers placed single drops of sea water (and other ionic solutions) on top of strips of monolayer graphene and then dragged them around. Doing so, they discovered, resulted in the generation of electricity—adding more drops or increasing the velocity of dragging increased the voltage. To understand why, the team took a closer look. As it turned, out, the explanation was simple. When a saltwater drop sits still on top of a strip of graphene, any charge is redistributed symmetrically on both sides of the drop, leaving zero net potential difference between them. When the drop is moved, however, the distribution becomes unbalanced—electrons are desorbed at one end of the drop and absorbed at the other, generating a small amount of voltage—just 30mV—enough to allow the team to use it as part of a handwriting sensor and as part of an energy harvesting device. Using the newly discovered technique to generate electricity isn't going to become a commercial proposition anytime soon, of course, as there is still the tricky problem of creating mass amounts of graphene at a reasonable price. But if that ever happens, people everywhere could very easily create their own electricity, as it appears the process is exceptionally scalable. Since the early nineteenth century, it has been known that an electric potential can be generated by driving an ionic liquid through fine channels or holes under a pressure gradient. More recently, it has been reported that carbon nanotubes can generate a voltage when immersed in flowing liquids, but the exact origin of these observations is unclear, and generating electricity without a pressure gradient remains a challenge. Here, we show that a voltage of a few millivolts can be produced by moving a droplet of sea water or ionic solution over a strip of monolayer graphene under ambient conditions. Through experiments and density functional theory calculations, we find that a pseudocapacitor is formed at the droplet/graphene interface, which is driven forward by the moving droplet, charging and discharging at the front and rear of the droplet. This gives rise to an electric potential that is proportional to the velocity and number of droplets. The potential is also found to be dependent on the concentration and ionic species of the droplet, and decreases sharply with an increasing number of graphene layers. We illustrate the potential of this electrokinetic phenomenon by using it to create a handwriting sensor and an energy-harvesting device. It will pay to keep an eye out for further developments making use of this discovery. Whoever is first to find a cheap method industrial-scale graphene manufacture will have massive influence over the course of future events.